It has been a busy holiday season for us and we are excited to share all that we have been doing globally. Zendesk Neighbor Foundation elves have been volunteering in a variety of ways—helping to distribute presents, raise money, sing carols, and deliver holiday cheer! Here is a look at what we have been up to in many of our offices. In London, we hosted many activities to support our neighbors at Children of St. Mary’s Intensive Care (COSMIC). COSMIC supports the Children’s Intensive Care Unit at St Mary’s by helping patients and their families, and enabling their dedicated team to treat hundreds of critically ill children each year. We hosted a client dinner where we asked attendees to bring a gift for COSMIC . Through this client-supported drive, we were able to collect over 200 gifts. Our employees then held a wrapping party to make sure all the presents made it to Santa’s grotto in time for COSMIC’s holiday party. In addition, we had a group of Santa’s helpers volunteer at COSMIC’s Christmas Concert. The concert was held for past and current patients to spread the seasonal spirit and included festive readings, holiday songs and holiday treats. Lastly, four of our employees completed the Santa Run on behalf of COSMIC alongside 4,000 other charitable Santa's to raise money for the children of COSMIC and their families. In response to a typhoon that hit Manila in October, we organized a relief operation with Hands on Manila in a small town, Nueva Ecija. The entire town was submerged in water during the typhoon causing widespread damage and disruption to the town. We drove 3 hours to deliver much needed supplies such as bedding, kitchenware, groceries, hygiene and first aid kits complete with disaster bags to help people recover from the calamity. To keep spirits up as the holidays approach, we also gave out Christmas gifts and Noche Buena (Christmas Eve dinner packages) to 80 families in the town. We began the month with a Children’s Book Drive to donate to Madison Reading Project, a literacy program for vulnerable youth. Additionally, to help keep those in need warmer this winter, we collected winter clothes for the Salvation Army. Lastly, we partnered with Social Media Breakfast to provide gift baskets to the nonprofit panelists who were discussing how they use social media to increase awareness and attract volunteers and donors. 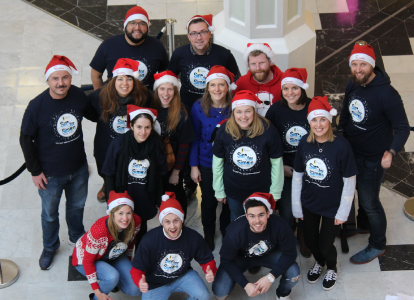 We caroled our way through the holiday season, all while raising money for Dublin Simon Community as part of their ‘Sing for Simon’ fundraiser. Simon works to prevent homelessness and provides essential services for people who are homeless. In HQ, we sponsored 6 families for Compass Family Services Adopt-a-Family project. This program matches donors with families who are homeless or extremely low-income. Through participation from most of the office we were able to purchase all of the gifts for our neighbors. We even had a group of volunteers help give the presents to the families. Additionally, we partnered with Community Housing Partnership to deck seven of their tenant buildings with holiday décor. Finally, we helped deliver holiday gifts to the seniors at a single-room-occupancy hotel in the neighborhood as part of our weekly Meals on Wheels shift. Thank you to all of our non-profit partners who are Santa’s real helpers this holiday season and all yearlong. On behalf of the Neighbor Foundation, happy holidays!